The only way to change this menu up to Excel 2007 is to use VBA code, but in Excel 2010-2016 you can also change a context menu with RibbonX. Note : In Mac Office 2016 it is not possible anymore to change this menu with VBA code, RibbonX is the only way to do it in the Mac 2016 version, RibbonX is not working in Mac Office 2011, you need VBA code in this version. The advantage of RibbonX in Excel 2010-2016 is that you can add controls that are not possible to add with VBA, the following lists the controls allowed in context menus. But this will only work in Excel 2010-2016, so if not all your users use Excel 2010 or higher it is better to use VBA code to change your context menu so it works in every Excel version. See this page for VBA code examples that are working in almost every Excel version(not in Mac Office 2016 anymore). Note: I suggest that Mac developers develop on a Windows machine so they can use the Custom UI Editor. Be aware that imageMso is not working in Mac Office 2016. Important : Mac Excel 2016 must be version 15.17 or higher, before that RibbonX is not working in Mac Excel 2016. This example will add a custom button, built-in button (Save) and a Custom menu on top of the Cell menu. 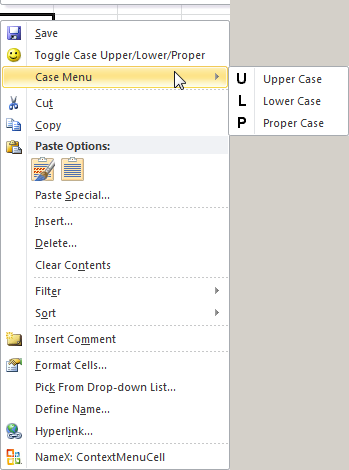 <button id="MyButton" label="Toggle Case Upper/Lower/Proper"
Bug: When you close the workbook every control you add is removed from the Cell menu, but if you select another workbook the built-in Save button that we added to the Cell menu is not removed. This seems to be a problem when you add built-in controls to a context menu. If this is a problem for you you can insert a custom button instead that calls a macro that executes the built-in Save control in this example as a workaround. But with ExecuteMso you can execute every built-in control on the Ribbon or context Menu. Dynamic menus point to callback procedures that create the menus at runtime. The dynamicMenu control includes the getContent attribute that points to a GetContent callback procedure. This is the RibbonX in custumUI14.xml that create a dynamic menu in the Cell context menu. label= "My Dynamic Menu" imageMso="HappyFace"
For example, the following VBA code builds a dynamic menu at runtime with two buttons, which means that it is not created until the menu control on the context menu is clicked. You can find all the information about the example in the relevant workbook.